In the publishing industry, much has been made of “the sophomore curse” that seems to bedevil authors’ second books. They’re sometimes criticized for being not quite as good as the first, and it’s not always the authors’ fault. Many years may have been spent writing the first book which received meticulous attention and was polished to a gleaming shine before being released. After its publication fans clamor for more. Authors are under pressure to meet that demand and get a second book out, fast! Often the authors have received a three-book publishing contract that requires the second book to be out in a year. That second book simply doesn’t have the luxury of being babied the way the first one was. The stakes are especially high when that second book is a sequel. Familiar with the characters in my first book, The Lost King, readers had questions that they hoped to see answered. In the months it took me to write The King’s Ransom, they had plenty of time to develop their own opinion about what should happen next. It was stunning, validating, and inspiring to learn that readers so enjoyed The Lost King that they wanted more. As encouraging as that was, I did feel the pressure to get the second book written quickly. Being the author, I had the story uppermost in my mind. 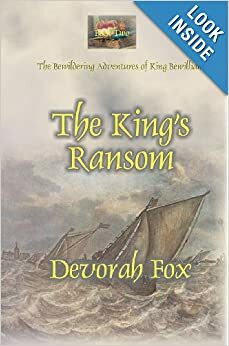 I was working on it and living with it every day, but my readers were off leading their lives, King Bewilliam’s challenges the furthest things from their mind. Would they have forgotten all about him by the time I finished a second book? I think I may have held my breath the entire time I wrote The King’s Ransom. I will confess that I didn’t lose a lot of sleep wondering what readers would like to see happen, despite the fact that I actually had suggestions. One reader even wrote quite a bit of fan fiction. I found his take on the story illuminating and inspiring but that was his vision, not mine. I had my ideas about where the story should go next. Once I started writing, I found, as is often the case, that the characters themselves had plans of their own! I also didn’t worry much about whether the writing was any good. I learned a lot about craft while writing The Lost King and in the months before I started The King’s Ransom. I also had the advantage of read-and-critique with some great wordsmiths in the writing groups to which I belong. The King’s Ransom has received great reviews in the few weeks that it’s been out. Fans are pleased, stating that this book is even better than the first. Looks like I’ve beaten the sophomore curse!